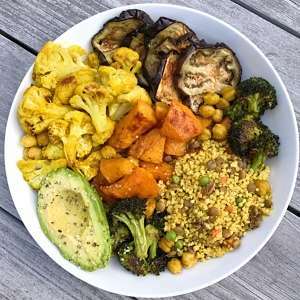 Tonight’s dinner is Roasted Turmeric Cauliflower, Roasted Eggplant, Roasted Spiced Butternut Squash, Roasted Broccoli, Roasted Turmeric Chickpeas, 1/2 an Avocado and New Hilary’s Millet Medley in Golden Curry. Best part is that I roasted all the veggies yesterday and heated up the Hilary’s Millet Medley today in less than 5 minutes to give it all a new fresh taste and feel. Hilary’s recently launched a line of Millet Medley’s and they are delish! Certified gluten-free, non-gmo, organic and Allergen Free, the are made with real whole foods and spices, all ingredients you recognize! A Fall inspired Buddha Bowl with all favorite vegetables. The best part is that the veggies were roasted yesterday and all I did today was heat up a Hilary's Millet Medley (Golden Curry flavor) when we were ready to eat and it was like a freshly cooked meal in minutes. Recipe done in partnership with Hilary's. Butternut Squash: Preheat oven to 375 degrees. Gently toss squash with 2 tbsp avocado oil, cumin, paprika and sea salt. Lay in a single layer on baking sheet. Roast 20 minutes. Turn butternut squash over. Roast another 10-15 minutes until tender. Prepare Millet Medley according to package.